A cluster of new homes going up in Carver is signaling the end of a decades-long revitalization program’s impact on the neighborhood. Local nonprofit Project:Homes has started construction on nine houses in the 1200 block of West Leigh Street. 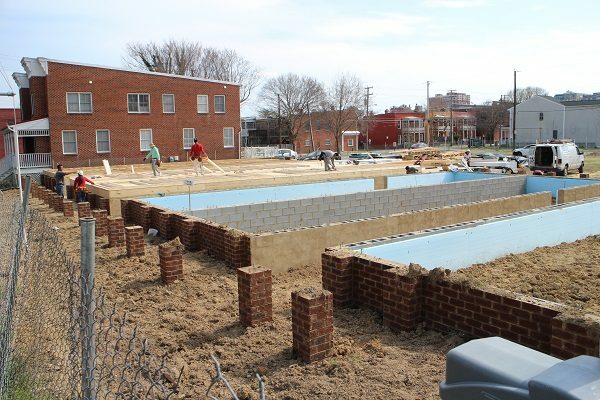 Marion Cake, the nonprofit’s neighborhood revitalization director, said the new homes – three sets of attached units and one detached home facing Leigh, and behind those, two detached homes facing Catherine Street – mark the end of the final stage of Richmond’s Neighborhoods in Bloom program in Carver, one of seven historic neighborhoods that the program has targeted since it launched 20 years ago. 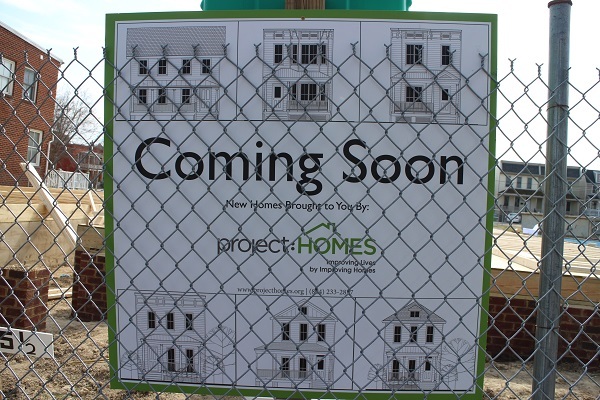 A sign on the site shows renderings of the homes. With participation from nonprofits such as Project:Homes, the program has restored and rebuilt hundreds of homes in those areas, which include Carver/Newtowne West, Church Hill, Highland Park, Jackson Ward, Oregon Hill and Southern Barton Heights. While Cake said Project:Homes’ involvement in the program in Carver came later than other groups, the nine homes it designed and is building in that block, catty-corner from Carver Elementary School, are the last of 20 it has contributed to that neighborhood and in nearby Newtowne. The homes are targeted to homebuyers making at or below 80 percent of the area median income – currently about $46,000 for an individual buyer, Cake said. The nine homes are a collaboration with the city’s community development department, which Cake said provided funding, and the Richmond Redevelopment & Housing Authority, which acquired the land and sold it to Project:Homes. City property records show the lots were transferred in 2017. Each of the two-story homes will total about 1,200 square feet, most with 15-foot widths to accommodate the narrow lots. Involvement from Wells Fargo will equip the homes with solar panels that Cake said are intended to keep homeownership costs low in the long run. “These will be net-zero houses, so they will produce as much electricity as they consume, if all goes well,” Cake said. Two of the Leigh Street units started going vertical this week. Cake said the site required soil remediation that contributed to the project schedule. 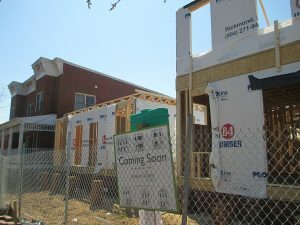 Construction started three weeks ago and is set to deliver the first of the homes this summer. The homes are similar to others the nonprofit has built in Church Hill in the 1300 block of North 28th Street and the 1200 block of North 27th Street. With the homes wrapping up the Neighborhoods in Bloom program in Carver, Cake said Project:Homes will be maintaining its focus on projects in other areas where it’s active, such as Blackwell, Randolph and Southern Barton Heights. The nonprofit is also busy in parts of Chesterfield and Henrico counties. The homes add to other efforts increasing Carver’s housing stock. A block away on West Clay Street, Virginia Supportive Housing is wrapping up work on its New Clay House rehab, increasing the number of apartments there from 47 to 80. Jonathan Spiers joined BizSense in early 2015 after a decade of reporting in Wilmington, N.C. Prior to that he was with the Henrico County Leader. The Virginia Tech graduate covers residential real estate, advertising/marketing, government and other news. Reach him at [email protected] or (804) 308-2447. 1 Comment on "With new homes on Leigh Street, revitalization program reaching full bloom in Carver"
In order to foster transparent, civil conversation, please include your full name when posting comments. The solar generation element is interesting. What is the payback period for such an addition? How any years does it take to break even for the needs of a family in 1200 sf?